Are you unsure where to look for the next addition to your mountain bike wardrobe? We’ve checked out five of the best trail jerseys that the southern hemisphere has on offer in order to help you make that decision. Instead of making the same kit choice time and time again, we’ve compiled a group test of five three quarter length sleeve trail jerseys with the aim of giving you some real life input into how these garments fit and perform. Jerseys come in many shapes, sizes, fit, length and sleeve variety. Each component as important as the last and each a personal choice for the wearer of the jersey. To complicate matters further, what one manufacturer says is fitted or loose may not quite be the case when it comes to wearing said item. In short, without being able to try before you buy, it can be a minefield. First up is a jersey designed and made in Nelson, the Nancy brand is full of gorgeous patterns that look great on and off the bike. The shirts devised by the ladies at Nancy are composed of a New Zealand Merino and Tencel rear with a funky coloured contrasting front. Tencel is a fabric made from wood which when combined with merino is noticeably softer and faster drying, meaning we were kept comfortable out on the trails even in the Nelson sun. The Nina jersey is a relatively close fit, our tester opting for an XS, which gave a nice shape and was loose enough to move freely in. The merino portion at the rear extends through to the side panels giving enough stretch to compensate for the cotton front meaning we never felt restricted. The sleeves sit just above the elbows and lie without flapping when riding. The bottom of the jersey sat just below belt buckle height, Nancy told us they are planning to make this a tad longer for future runs. Each Nancy shirt is individual, with pattern placement varying on each one, the benefits of a small production also mean attention to detail is high. There is a design to suit every taste, with new fabric being introduced all the time. We have to admit; our tester wore this to the office a few times before she hit the trails in it! The Ground Effect range of clothing is simple, straightforward, no-nonsense kit at its best and the Jigsaw jersey is no different. Made from ‘HyperActive’ material, it is quick drying and has a UPF 50 incorporated to ward off the sun’s rays. We didn’t overheat and found this jersey was equally suited to both warm daytime rides and cooler evening ones. The jersey is super stretchy and a good length ensuring that there is no riding up the lower back. The sleeves of the jersey again sit just on the elbow, our tester wore a size small jersey (WS) and found the arms to be close fitting, she doesn’t have huge ‘guns’ either! This didn’t cause any discomfort though and was soon forgotten. The Ground Effect Jigsaw features a hip pocket, if you like to use them. This one is easily accessible with a chunky, easy to grab zipper, its large enough for a good size mobile or snack bar. Look closely and you will find a secret tube repair patch stashed on the seam here too – ingenious. The Jigsaw is not too 'in your face’ if bright and loud isn’t your thing, with a splash of colour over the range, it makes a great everyday piece. For just $89.00 the Jigsaw has everything you need, a well thought out jersey, using a good technical fabric which is hard wearing and will withstand a bump or two without being fazed. DHaRCO are no nonsense brand who's aim is to design lifestyle clothing that works as great sportswear. 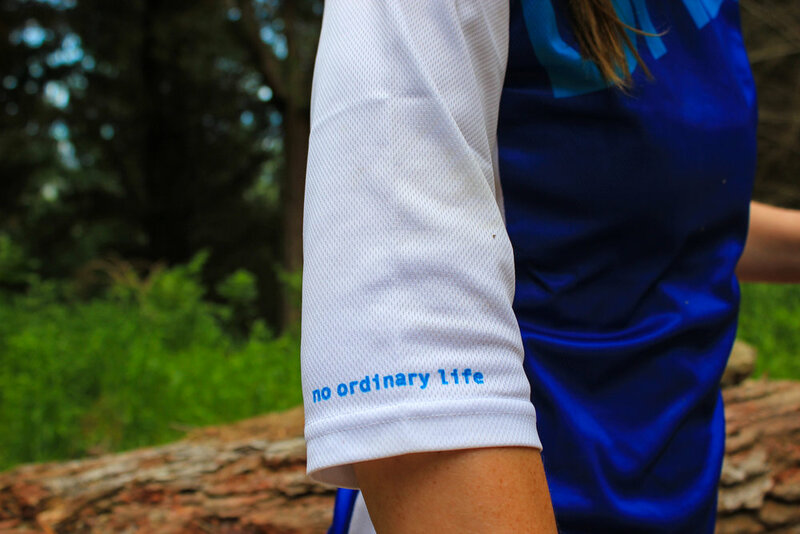 Their Ladies ¾ Sleeve jersey is made of moisture wicking fabric which Despite feeling heavier than others in test we had no problems breaking a sweat and cooling off. The fabric of this jersey is more of what you might call a ‘traditional’ riding jersey material but it is still breathable, a feature which can partly be attributed to the mesh side panels. The denser fabric also withstood crash landings very well, making this the jersey of choice for when the trails get rowdy! The DHaRCO jersey sports a pocket with invisible zip in the side panel, great for small essentials if you don’t ride with a pack. Fit wise, there is nothing to complain about here, the length is great reaching over the belt line, the sleeves fall just below the elbows for extra protection and the jersey is shaped well for the feminine form, nipped in at the waist whilst still maintaining a looser feel. A word of warning though, our size 8-10 tester was comfortable in a medium size jersey, so these may size up a little small. Coming in at just $65.00 AUD this jersey is a bargain and one that we think, in at least one of its colour variations, might be in your wardrobe for years to come. An offering by Giant, the Liv brand has grown to include a full lineup of bikes and kit for the female rider. Given the rate that the bikes fly off the shelves here in NZ we thought it was about time we had a look at their kit too. Making jersey’s in a size XS through to XL, this is no small production for Liv. Our test jersey, the Tangle, featured a shaped collar, flat lock seams and is made from a moisture wicking TransTextura fabric which felt to be one of the lightest on test, a great feeling in hot weather. The TransTextura fabric uses larger yarns next to the skin and finer ones on the surface of the garment in order to draw moisture away more quickly. In addition to this cooling fabric the shaped side panels are made from quite a large mesh material, not enough so you can see your undies but enough for us to really feel the cool air flowing. Our tester opted for a size small which was relatively fitted but quite a nice long length. The arms again here could have been looser but a slit cut into the elbows ensured full movement was available. Its great to see a bike brand design clothing which isn’t overtly shouting it’s own name in a marketing led frenzy. This is a bold jersey and if purple is your thing (black and white available too), it will look and feel great whatever brand of bike you choose to ride. Based in Wanaka, Mons Royale specialise in merino kit that they say aims to be versatile and stylish. We’d say they have got this spot on with the Phoenix ¾ Raglan Tee, it’s smart simple and looks great either on or off the bike. Our tester wore an XS for this test and found the jersey fitted just like a regular skinny tee, she’d have been happy in a small too though for a baggier fit. In an XS the jersey was roomier in the arm department than other jersey’s in this test and was the only one to feature a dropped hem at the bag to prevent riding up, we really liked this. The Phoenix Raglan is fully constructed from merino, with the rear panel being made from a ‘merino mesh’ to help when things get hot and sweaty. The neckline here is lower too than other jersey’s in the test, we found this created a more causal look but wasn’t so low that it impacted on performance or exposed skin which we didn't want either! There is a hidden sunglass wipe on the inner front hem of the jersey which as always is super useful to keep glasses in top condition. We found this offering from Mons Royale perfect for chilly evening spring rides. Temperature wise it’s not the coolest of jersey’s but then we kind of figured that as it's made entirely from merino, that’s ok though as we have a short sleeved version too – winning! This garment excels to keep you warm in a cool evening breeze, drying quickly, it looks great as an après bike casual in the pub afterwards. At just $65.00 AUD, its hard to say no to this jersey from DHaRCO, in fact it’d be hard to say no to buying two! Not the cheapest but certainly giving its most in the feature department, the Ground Effect Jigsaw has loads going for it.